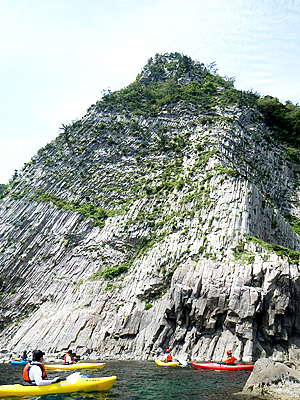 Let’s travel around geosites by sightseeing boat, canoe, SUP, or rental bicycle. 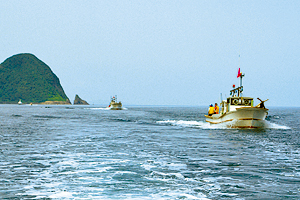 With the aspiration to show the sea to children, local fishermen started the operation of the leisure fishing boat “Tobimaru Taxi.” Viewing a magnificent panorama of the sea of Tango, enjoy its scenic spots, nature, and wildlife. Watching seagulls fly about the coast and sailing out to sea, you can enjoy truly luxurious moments⎯viewing the dynamic landscapes of rock beaches, ever-changing skyscapes, waves, mountains, and varying “colors” of the wind. 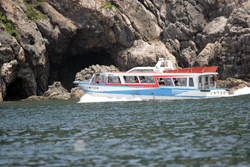 【Hours】 9:00-16:00 ※Boat tours take about one hour. * You can rent one fishing rod for more than one person. >>Click here to download a PDF file of the tour leaflet. >>Click here to visit the official website. Tour the sea of Tango by leisure fishing boat and fully enjoy its fascinating landscapes. Sailing out to sea from the Asamogawa Fishing Port in Amino-cho by the boat “Urashima” and touring around the sea of Tango, have a nice “marine drive” during which you can see the famous rock believed to have connections with the legend of Urashima Taro and with the story of Minamoto Yoshitsune and Shizuka Gozen. Come and join our tour featuring legends and historical episodes. Let’s enjoy a boat ride during which we tell you about the legends of Urashima Taro and the famous couple Minamoto Yoshitsune and Shizuka Gozen, and many other stories. 【Operating Period】 May up until the days in September on which the sea is calm * Tours may be cancelled depending on the weather. >>Click here for related information. 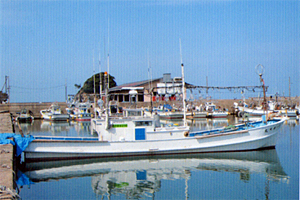 Let’s go on a boat ride though the Kumihama Bay area, which constitutes the Kotohikihama-Kumihama geoarea of the San’in Kaigan Geopark, and enjoy its fascinating landscapes. This area boasts many colossal geospots. Viewed from the bay, beach landscapes take on unexpected beauty. Accompanied by the captain’s thorough and easy-to-understand talk on the history, culture, and nature of Kumihama Bay, this tour is recommended particularly for those who wish to know more about Kumihama. 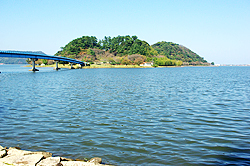 Come and feel the abundant nature of the peaceful bay of Kumihama. ◎Comment from the captain Why don’t you join us and enjoy the landscapes of the Kumihama Bay area from our boat? Viewed from the sea, landscapes take on refreshingly different appearances than usual. 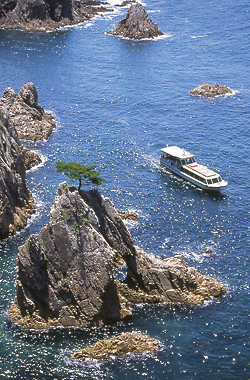 Come and feel the abundant nature of the peaceful bay of Kumiyama. >>Click here to download a PDF of the tour leaflet. 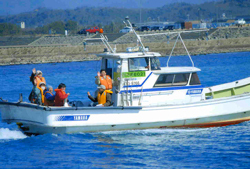 Let’s enjoy the magnificent nature and beautiful coastal landscapes of the Tajima Coast by the sightseeing boat “Iwatsubame.” From the sea, the coastline takes on different charms than those seen from land. On July 27, 1982, we had the honor to receive the then Crown Prince and Princess of Japan on our boat and take them on a journey from Moroyose Port to Kasumi Port. You are welcome to join our tour and enjoy the beauty of the coastline, comprising many mysterious masterpieces created by Mother Nature and various dramatic developments in the Japan Sea formation period. 【Operating Period】 Period] Year-round * Tours may be cancelled depending on the weather. 【Other】 * Free shuttle bus is available from mid-March to late November (By reservation only). * For groups, a 10% discount is given to a party of 15 or more passengers for all the above courses. * Tour courses are subject to change depending on the wave conditions on the day. * Under some circumstances, we may not be able to go on the course of your choice. >>Click here to download a PDF of free shuttle bus information >>Click here to download a PDF of the tour leaflet. Navigated by a captain who is also a fisherman, this small boat tour will take you to less frequented cave tunnels not accessible by a bigger sightseeing boat. Join our tour to see for yourself the magnificent landscapes of cave tunnels and strange-shaped rocks, masterpieces created by Mother Nature. 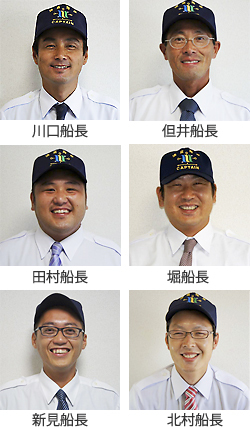 【Operating Period】 May to September * Tours may be cancelled depending on the weather. 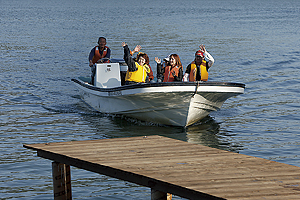 【Other】 * As a rule, you are asked to charter the boat for a boat tour. * For safety reasons, we will take passengers with children on boat tours only when the waves are one meter or lower. 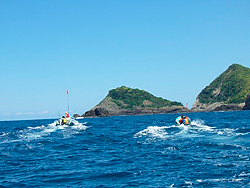 Enjoy a slow and leisurely cruise along Uradome Beach from Ajiro Port to the Shirawara Coast. Through the dazzlingly transparent sea water, you can see depths of 25 meters. 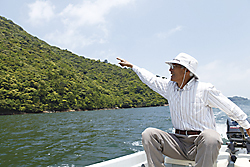 Because the boat does not rock so much, you can enjoy a comfortable and relaxed cruise. 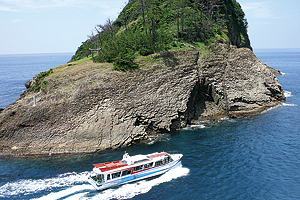 If you want to observe nature more closely, join a tour by the small boat “Uradome.” Navigating through the narrow waterways not accessible by usual sightseeing boats, this small boat provides opportunities to view towering cliffs as high as 70 meters from up close. Using a water glass, you can also observe the underwater world. （Captain Kawaguchi）The landscape of Uradome Beach is the most beautiful when the sun shines after the rain has stopped. It is as if the earth has refreshed itself and is breathing. （Captain Tai）The Sea of Japan has varied expressions—sometimes gentle and calm, sometimes angry and stormy with large waves rolling toward the shore. Uradome Beach has its special beauty even when the sea is raging. A magnificent creation of Mother Nature, Uradome Beach features plenty of breathtakingly spectacular landscapes. （Captain Tamura）Our small boat, the Uradome, travels through the narrow waterways not accessible by usual island-hopping boats. When the sea is calm, our boat tour will take you through caves and cave tunnels, an adventurous experience unique to our geopark. Enjoy overwhelming views of the islands from up close. 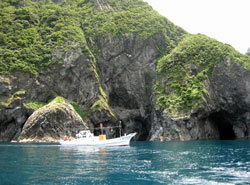 （Captain Hori）The refreshing and dynamic landscapes of Uradome Beach are particularly moving when seen from the boat. Enjoy the beauty of Uradome Beach, which changes its expression day by day. （Captain Niimi）On Uradome Beach, you can see seagulls, black-tailed gulls, wild cormorants, and many other wild animals depending on the season. If you are lucky, you can even see wild dolphins. During our boat tour, enjoy looking for and seeing many wild animals with your own eyes. （Captain Kitamura）I love and take pride in the transparent sea of Uradome Beach, which spreads far and wide. Our tour will take you to many highly transparent spots so that you can enjoy Uradome Beach’s abundant nature from up close. * For passengers who have made a reservation as a group, the boat will depart at the time specified for the reservation. * Tours may be cancelled depending on the weather. This sightseeing boat slowly navigates Koyama Pond, the largest of the lakes in Japan that bear the word “pond.” A “Koyamaike storyteller” accompanies you on the boat tour, telling you many legends and folk stories associated with Koyama Pond, stories and episodes about such islands as Aoshima and Nekoshima, and about fishing in Koyama Pond. Enjoy the 40-minute boat tour, during which you can feel as if you have gone back to the old days. * If the passenger capacity is exceeded, we may operate an extra service. 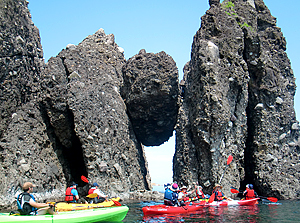 This adventure tour travels through the Takeno area of the San’in Kaigan Geopark by sea kayak. From May to September, the Japan Sea is calmer than the Pacific Ocean. Enjoy truly fascinating moments in the emerald green sea with the expanse, color, and transparency that match those of Okinawa and major overseas resorts. 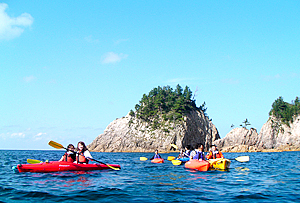 Join our geo canoe tour and enjoy landscapes and places that cannot be seen or accessed from land. * Operating periods vary depending on the course. *Prices vary depending on the course. Located almost at the center of the San’in Kaigan Geopark, Kasumi Beach boasts extremely varied geomorphological and geological features. 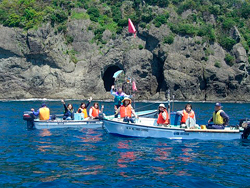 On the sea off Kasumi Beach, you can see various must-see spots of the Geopark from up close, such as Tsuriganedomon, the largest cave tunnel in the San’in Kaigan area, and the Yoroinosode Cliffs, a government-designated natural monument. 【Other】 * Tours may be cancelled or courses may be changed depending on the natural conditions of the day. 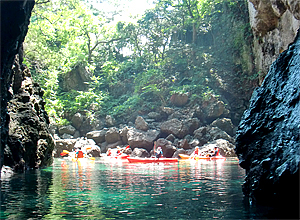 Uradome Beach Tours by Sea Kayak/Clear Canoe Join our tour that travels through the Uradome Beach area of the San’in Kaigan Geopark by sea kayak. A transparent canoe known as “clear canoe” is also available, enabling you to see through the bottom of the canoe the fish and algae in the sea. 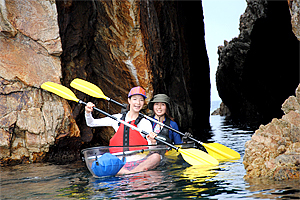 A guide will accompany you on the tour, so that you can fully enjoy the sea while taking photos and shooting videos. 【Other】 * Tours may be cancelled or locations may be changed depending on the weather. Our instructor will call you the day before or on the day of your tour. 【Where to Book】 Iwami-cho Nagisa Exchange Center 0857-73-0118 Closed on Mondays (Closed on Tuesday if Monday is a holiday) >>Click here to visit the official website. 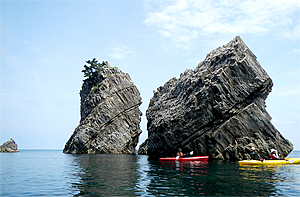 Let’s ride a SUP to Hasakari-iwa (rock between rocks) and Yodonodomon cave tunnel. G-SUP is a safe and pleasant sport. We welcome beginners. What is special about G-SUP is the refreshing sensation of being merged into the sea, which gets you out of the hustle and bustle of everyday life. You can also see landscapes that you have never seen before (because your eye level is much higher than sea level). 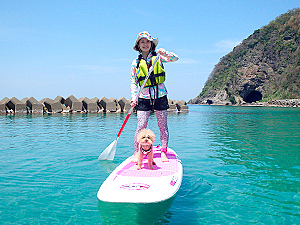 On a SUP, you can enjoy various experiences⎯cruising, surfing, fishing, and exercising! 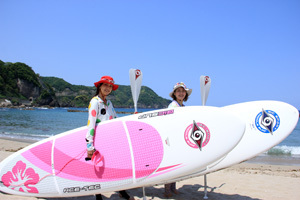 Let’s tour the beautiful sea of Tottori by stand up paddle board (SUP). A water activity originating in Hawaii, a SUP is a board floated on the water on which you stand and paddle. What is special about SUP is that you can use it in various environments—seas, rivers, lakes, and more. Ride a SUP and feel the beauty of the sea in the San’in Kaigan Geopark. 【Other】 – At least two applicants required for our experience class. * Fifth-grade and older children are also eligible to attend the experience class. – Rental service may be cancelled depending on the weather or wave conditions. – For safety reasons, rental packages will not be provided to those who have no experience in this sport. Why not join our tour and travel on the sea by stand up paddle board (SUP)? Bigger and steadier than the usual surfing board, you can ride a SUP easily if you practice a little. On the SUP, your eye level is much higher than the water level, and so you can feel as if you are standing on the sea. The sea of Iwami is extremely transparent such that you can often see fish through the water. 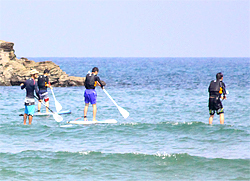 SUP is a marine activity that even beginners can fully enjoy. – In summer, we conduct a sunset viewing tour from 17:00. * Changing room and hot shower are available (200 yen ). 【Other/Notice】 – At least two applicants are needed to hold the experience class. * This experience class admits only junior-high-school children and those older. The class may be cancelled depending on the weather. 【Other】15 bikes for adults and 3 bikes for children are available. 【Closed】Booking is needed for rentals on Saturdays, Sundays, and national holidays. 【Other】7 power-assisted bikes and 8 regular bikes available * Number of bikes available for rental is subject to change depending on the season. ◎Power-assisted bikes rented at one of the bike rental stations in Iwami-cho, Tottori Prefecture (Iwami-cho Nagisa Exchange Center, Iwami-cho Iwai Fureai Yasuragi Hot Spring Facility, Iwami-cho Tourism Association, San’in Matsushima Yuran Co., and Uradome Tourism Association) may be returned to any of these stations. ◎Bikes rented at one of the bike rental stations in Tottori City, Tottori Prefecture (Bicycle Parking Area No. 2 under the Elevated Structure of Tottori Station, Tottori Sand Dunes Information Center Sandpal Tottori, and Tottori City Katahara Parking Area) may be returned to any of these stations. For a limited time during the year, the JR Sanin Main Line operates extra rapid service trains that stop at Kinosaki-Onsen, Takeno, Iwami, Tottori, and other stations, from which you can easily access the San’in Kaigan Geopark area. Riding these trains, you will be able to travel fast and efficiently throughout the Geopark. * Photo is for illustration purposes only. * Trains other than this may be used. “Tango Akamatsu” travels along the Japan Sea coast and “Tango Aomatsu” passes through Mt. 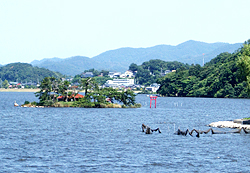 Oeyama. These two trains have a retro exterior and a warm and woody interior. Inspired by landscapes with white sand and green pines found along the Kyoto Tango Railway, such as the famous pine-covered sandbar Amanohashidate, these trains were designed under the theme of pine trees. The “Tango Kuromatsu” train provides three tour packages with dishes, drinks, and sweets made from ingredients available in the localities through which it travels. These trains will promise you pleasant trips in which you can fully enjoy the beauty of Tango.